Both these articles draw on suffrage autobiography as ways of analysing why suffrage feminists were involved in militant activity and how they saw their campaigns as life-changing. The article on Mary Richardson looks at how she re-writes her life history as a way of justifying her political involvement in the British Union of Fascists in the 1930s. 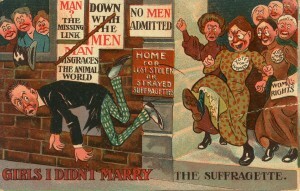 The article on ‘Searching for the past’ looks at the reasons for former suffragettes writing their autobiographies in a period in which although the vote was won their political hopes and dreams were by no means realised . To some extent this article came out of my work for Deeds not Words in which women teachers held to the beliefs that had defined them many decades previously. Unsurprisingly, many of the things I wrote in the 1990s came out of the labour movement defeat in the 1980s, particularly the miners’ strike and rate-capping. I was interested in how people carried on in their core beliefs when the world around them had changed.